“To collect a hand full of earth and listen to what the earth and your fellow humans have to tell you.” That is how I would describe an Earth Forum! The method of the social sculpture “Earth Forum”, developed by Shelley Sacks, a student and assistant of Joseph Beuys, now professor in Oxford, offers special and stimulating ways of working out in small groups how we could live together in peace on this planet. 1. The skill of envisioning. Every human has, regardless to her or his education, the power of envisioning pictures in her or his mind, to reflect them and to share them with others. Unfortunately, we often forget that these skills of envisioning and empathy are the key to creativity which enables us to create our lives in a conjoining way. 2. The ability to listen without validating and judging. A member who speaks will not be interrupted or disturbed in any way. After all, a nonviolent communication is practiced. 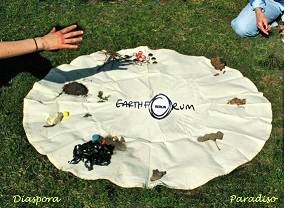 There are no further rules or intentions set for the Earth-Forum. It is a creative process which shows that there are more sensible “negotiations” possible between different points of view, when we really understand, what the other persons see and say.